In simple words, it’s a typically long double-breasted raincoat with deep pockets and a belt. 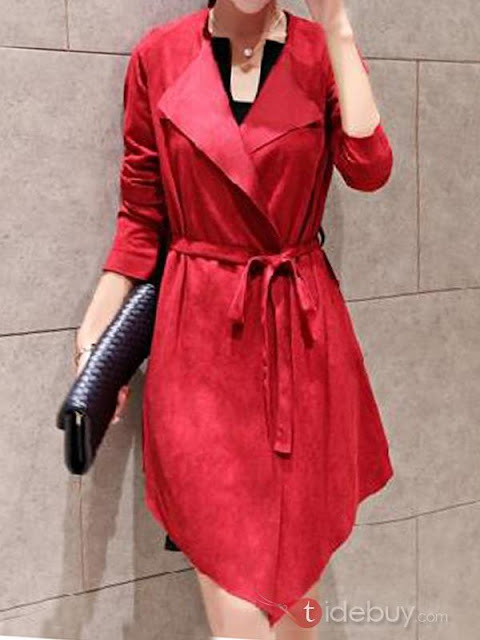 Modern and stylish women are fortunate as today’s trench coats come to you in different lengths, colors, materials, and chic fashion details. Many women love wearing this outerwear. Whether you are fond of a classic style or trendiest style, you will find coats that suit all budgets at tidebuy trench coats collection. Trench coat is suitable for what weather? I guess lots of you put on this coat during fall season. Actually, you can use it year round -no matter the season. It all depends on its fabric and thickness. Cotton trench can be used every time as a light jacket. Wool trenches are for winter while waterproof ones are perfect to protect your body during rainy days. Even pure modish trenches that made of silk, organza or satin are already available in the stores currently. Trench coats are loved since it gives you elegant and glamorous look. Wearing trenches could show your personal fashion statements. For example, your silk trench can be look like a short sleeve silk dress by pushing up the sleeves to your elbows. You can also wear it open and belted, over your thin outfit. So, whatever your style, preference and need, are you looking for trendy but cheap trench coats? Don’t need to search anywhere. At tidebuy, you can easily get a range of coats that offered below $50. I’m not kidding here, just check out their collection here http://www.tidebuy.com/c/Trench-Coats-100571/. I’ve seen some fashionable and affordable trench coats that offered there. I’m sure that you’ll love their collection too!